There are numerous passages in the New Testament that indicate that the words “elder” (presbyter), “overseer” (episkopos), and “pastor” (poimen) all refer to the same group of men or office. Some think that overseers and pastors are distinct from elders, but this is not the case. All of these terms are simply different ways of identifying the same group of men. There is a parallel between the qualifications for a bishop (episkopos) in 1 Timothy 3:1-7 and those for an elder (presbuteros) in Titus 1:6-9. Paul uses both terms to refer to the same man (presbuteros in 1 Tim. 3:5 and episkopos in v. 7). The three Greek terms presbuteros, poimanino, and episkopeo are used by Peter as well in 1 Peter 5:1-2: “The elders (presbuteros) which are among you I exhort, who am also an elder, and a witness of the sufferings of Christ, and also a partaker of the glory that shall be revealed: Feed (poimanino) the flock of God which is among you, taking the oversight (episkopeo) thereof, not by constraint, but willingly; not for filthy lucre, but of a ready mind.” The point here is that these three different terms do not refer to the varying levels of authority or even separate offices as some churches teach. All of these terms are simple the various features of Christian ministry. When we study the New Testament, we see a consistent pattern of church leadership. Each local assembly of believers is shepherded by a plurality of God-ordained elders. To put it plainly this is the only pattern for church leadership given in the New Testament. Nowhere in Scripture do we find a local assembly ruled either by a single “pastor” or by the majority opinion. I realize that this idea might come as a shock to some of my readers, but this is what I believe the scriptures reveal! How about some examples of a plurality of elders? Titus 1:5 KJV – Paul, the Apostle left Titus in Crete and instructed him to “ordain elders in every city” (Titus 1:5 KJV). James 5:14 KJV – James instructed his readers to “call for the elders of the church” when they are sick. 1 Timothy 5:17 KJV – Paul refers to “the elders who rule well” at the church at Ephesus. 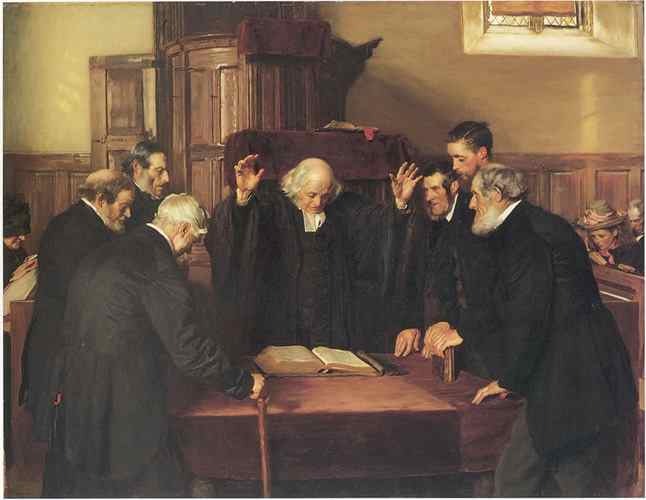 Acts 20:17 KJV – Paul addresses “the elders of the church” at Ephesus. Acts 11:30; 15:2 and 21:18 KJV – There were “elders” at the church in Jerusalem. Over and over again reference is made to a plurality of elders in each of the churches mentioned. When the term presbuteros (elder) is used in the New Testament, it is plural not singular. There is one exception. The exception is when John uses it to refer to himself in 2nd and 3nd John and where Peter uses it to refer to himself in 1 Peter 5:1. The New Testament just does not make reference to a one-Pastor congregation. The New Testament model for church government is for decisions to be made by a collective process. Even when the word presbuteros is not used in a passage we see reference made to a plurality of elders. Paul, in his epistle to the Philippians, refers to the “bishops” (plural of episkopos) and deacons” at the church of Philippi (Philippians 1:2). In Acts 20:28 Paul warned the elders of the church of Ephesus. Paul said that they should “Take heed therefore unto yourselves, and to all the flock, over the which the Holy Ghost hath made you overseers (plural of episkopos), to feed the church of God, which he hath purchased with his own blood.” The writer of Hebrews called his readers to “obey”(peithō – be persuaded) “those” leaders who kept watch over their souls. Paul in 1st Thessalonians called upon his readers to know them which labor among them, and are over them in the Lord; (1 Thess 5:12). Again this is a reference to a plurality of overseers in the Thessalonian assembly. There’s a lot to be said for the advantages of leadership made up of a plurality of godly men. Proverbs 11:14 says it the best “Where no counsel is, the people fall: but in the multitude of counselors there is safety.” This Biblical form of church government assures that decision are not self-willed or self-serving to a single individual. What about when there are divisions among the elders in making a decision? Well, the elders should study, pray and seek the will of God together until a consensus or majority opinion is reached. In this way, the harmony and unity that God desires for his church will start with those individuals that shepherd His flock. In the end, it’s all about leadership. A church reflects the character and qualities of its leadership. Scripture reveals the importance of qualified church leadership. And scripture clearly, spells out specific standards for evaluating those who serve in positions of leadership. 1 Timothy 3:2-7 and Titus 1:6-8 lists the qualifications for elders. According to these passages, an elder must be above reproach and the husband of one wife. He must be temperate, prudent, respectable, hospitable, able to teach and not addicted to wine. He must not be pugnacious. He should be gentle, uncontentious, free from the love of money and not fond of sordid gain. He should be a good manager of his household, one who has his children under control with dignity. He must not be a new convert and a man who has a good reputation outside the church. He should exercise self-control, be sensible and be able to exhort in sound doctrine and refute those who contradict sound doctrine. Lastly, he should be above reproach as God’s steward, not self-willed, not quick-tempered, loving what is good, just, and devout. As the apostolic era came to a close, the office of elder emerged as the highest level of local church leadership. It carried with it a great amount of responsibility. There was no higher court of appeal and no greater resource to understand the mind and will of God. The primary responsibility of elders is to serve as managers and caretakers of the church (1 Tim. 3:5). As the spiritual overseers of the church, elders are to determine church policy (Acts 15:22) and oversee the church (Acts 20:28). They should ordain others (1 Tim. 4.4, rule (by persuasion), and teach and preach (1 Tim 5:17). When necessary they are to exhort (Titus 1:9) and act as shepherds (1 Pet. 5:1-3). In regards to church leadership, there seem to be two extremes. Either the church is led by one man called the “Pastor, ” or there’s some form of congregational church government where the congregation rules. Therefore, many view the Biblical model of elder rule with suspicion. However, I believe the scriptures are clear. The biblical pattern for church leadership is a plurality of God-ordained elders. By following this biblical pattern, the church will maximize its fruitfulness. This form of church government provides checks and balances against extremes in church rule and doctrinal error.